Start the barbecue, if using. Coat the potato slices in 1 tbsp olive oil and barbecue over hot coals covered in a light layer of ash, or griddle over a high heat, for 5–6 minutes on each side until tender all the way through. Toss the squid in 1 tbsp olive oil and season. Barbecue or griddle for 2 minutes on each side, then toss in a bowl with the parsley, garlic, chilli and lemon zest. Drizzle with 1 tbsp olive oil. 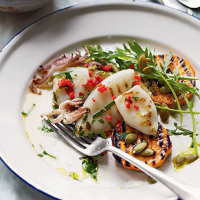 Toss the lemon juice and ½ tbsp olive oil in a bowl with the sweet potato, rocket and pumpkin seeds. Season and serve with the squid.